This pregnancy really is going by faster than I ever thought possible. With Christmas approaching I guess it’s going to make it go even quicker. I’m trying to get organised as I have Lucas’ birthday Christmas eve and then Tyler’s birthday 21st of January as well. Don’t want to be caught short in case I go into labour early and I have no presents in for my wee angel. Week’s 29 to 30 have been not too bad. 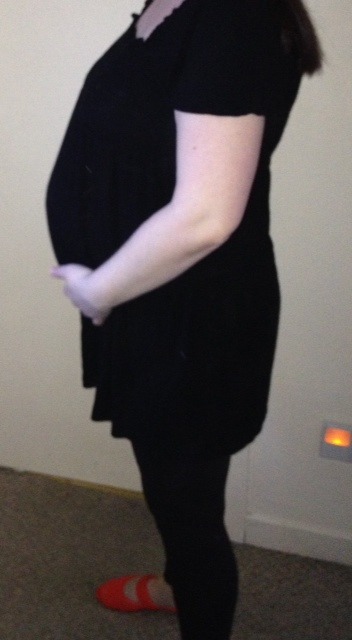 I’m getting a lot bigger, but unlike past pregnancies I don’t feel that the bump weighs a lot or giving me backache. I haven’t suffered from SPD like with Tyler so that’s all good. I am swelling more and more, my wrists look huge and my ankles and calf’s they are, well let’s just say they look like they belong to elephants. I haven’t been feeling sick since about 16 weeks so that’s another difference in this pregnancy, it was worse though in the first weeks leading up to 16 weeks. My bump is still flat at the front but I think that’s due to the anterior placenta. So what went wrong last week. Well, my breathing hasn’t been so great throughout this pregnancy, something I’ve never suffered from before. I don’t have asthma, never had a chest infection so other than a blocked nose, nothing has affected my breathing. Lucky I know. My husband and oldest son Lucas both have asthma so having seen them suffer I know how luck I am. Even at the start of this pregnancy I found myself quite breathless, but as it’s progressed I feel more and more like I cannot get enough air in my body. Walking just up the stairs I am gasping for breath at the top. Even sitting on my chair at work I get breathless. I have spoken to the midwife and the consultant about this who’ve checked my iron, etc and although low it’s not low enough that I should have any symptoms. They think it’s from hormones and just the pregnancy. Last Tuesday I got the boys ready for school as it was my day off work and set off on the school run. It was a cold day, but then I live in Scotland so nothing new there. I got across the road and felt really breathless, I just couldn’t get enough air into my lungs. I stopped walking but the boys kept asking why we’d stopped and trying to speak to them with not enough air wasn’t going so well. I started to panic about the fact I was with them on my own and decided to turn to go back home. As I did I passed out. I must only have been out for a few seconds and woke up hitting the ground. I smashed my face off the ground alone with my knees and hands. The boys stood still thankfully and were concerned with the amount of blood coming from my mouth and nose. I managed to get back home and called my sister in law to take Lucas to school and she took Tyler too to allow me to clean up. Robert came home and helped me out too. I called the midwife who wanted me to check the baby was moving ok, I still don’t feel this one move all that much but eventually I felt a bit of movement and things calmed down. I went to the doctor the next day and they say my nose is broken but would need it xrayed at a later date. Due to the pregnancy, they can’t do anything anyway so I’ll just leave it. I ended up with burst lips, cut hands and knees and my broken nose. I was not a pretty sight but mainly I’d gotten a fright. I just need to learn to manage my breathing better and hope it doesn’t happen again. Next week I get another growth scan at 32 weeks so it will be nice to see Cybher baby again. Yes he or she is called Cybher since he or she was conceived whilst I was in London at the conference. Not in the conference obviously, that would be wrong. So what do you think of Cybher for a middle name?